Incepted in the year 1968, we at New Trade Links are engaged in importing and supplying of SPECIAL LAMPS & SOCKETS for Printing, PCB, Medical, Textile, SSTV, Furniture, Aquariums, Color Sorters and related industrial applications. With our experience of 44 years, we have been able to establish ourselves as an Authorized Sole Distributor for Indian territory for M/s. Theimer GmbH, Germany and M/s. 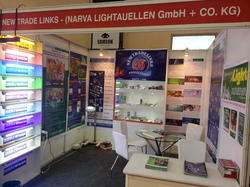 NARVA Lichtquellen GmbH Co. KG, Germany for their whole range of Products. In order to assist our ever increasing business activities, we have established an associate concern named SCIENCE IMPEX in 1974, who is Distributor for M/s. 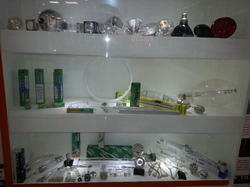 Excelitas Technologies, USA / Singapore for their whole range of Cermax Xenon Lamps and Opto-Electronic Products. Under the able guidance of our promoters, Mr. M.Kheemchand Jain, Mr. Tejraj Jain and Mr. K. Suresh Jain we have carved a niche in this competitive industry. Owing to their industrial expertise and able mentorship, we have expanded our base in Industries like Graphic Art, Medical, Textile, Garment, Color Sorters (Grain), Furniture, Aquariums, Water & Air Purification, R & D, Scientific & Analytical Labs, etc. In our wide range we offer, Dental Hardening Lamp (12v 100w flat Pin), Plate Exposing Lamp (1KW - 1000W), Examination Light (Spot Light) and Philips Infraphil150w. Apart from this, we also offer Fuji Exciter Lamp, Halogen Lamp, Hanaulux Blue 80 Spare Lamp Original, Lamp for 3M MP7720 Projector, Blackwood Lamp and U.V. Tubes. Our range finds applications in R & D and Quality Control Labs, Color Matching Cabinets, Airfield Lighting and Stage & Studio Lighting. These are procured from reliable vendors across Europe, USA and Asian Countries. Some of the companies from where we procure our range include Theimer, Sankyo Denki, Sylvania, Dr. Fisher and ALM to name a few. Low Pressure Sodium Vapor Lamps. Being engaged in the activity of trading, we understand that we play a crucial role between the manufacturer and our clients. Realizing this fact, over the years, we have developed a widespread network of vendors across Europe, USA and Asian Countries. These companies are well known in the market for offering quality lightning products and also as per client’s specifications. Their support and co-operation enables us in meeting the diverse requirements of our clients in a quick and prompt manner without any hassles.